Chronic sinusitis is one of the most common chronic diseases, including the United States, affecting people of all age groups. This inflammatory process involves inflammation of the sinuses and continuing for 12 weeks or longer. 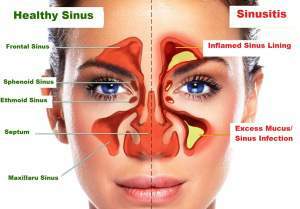 The literature reports that chronic sinusitis is almost always accompanied by the simultaneous nasal inflammation of the airways and it is often preceded by symptoms of rhinitis, thus developing the disease, known as «chronic rhinosinusitis». Most cases of chronic sinusitis are the continuation of undertreated acute sinusitis, however, rhinosinusitis usually manifests differently. Symptoms include nasal congestion, postnasal syndrome, facial swelling and discomfort. Chronic sinusitis may be noninfectious and related to allergy, cystic fibrosis, gastroesophageal reflux, or exposure to environmental pollutants. Allergic rhinitis, non-allergic rhinitis, anatomic obstruction in the ostiomeatal complex, and immunologic disorders are known risk factors. More common is infectious (bacterial) and chronic sinusitis (rhinosinusitis). But, in principle, the etiology has no decisive influence on the clinical picture – in all cases of rhinosinusitis appears about the same. Drug treatment is aimed at control of predisposing factors, elimination of co-infections, reduction of edema of the paranasal sinuses, and promote drainage of secretions. The aim of surgery is to restore sinus ventilation and correction of mucosal regulatory system in order to restore the cleaning of the nasal mucosa. Physical therapy action is the fastest and most efficient. Bacterial sinusitis sometimes cured within a day or two with persistent, hard treatment. FEYA and TEPLON devices influence on the mucous membranes of the nose and paranasal (frontal) sinuses by powerful dose heat have terminated under the reproduction and growth of bacteria, and then there is their rapid elimination. Securing a positive result within a few days worked wonders and often leads to a complete cure sinusitis.